Derek Boissonnault, Thornton Academy senior, sprints: Finished fourth in the 55-meter dash at the Class A state meet (6.90 seconds). 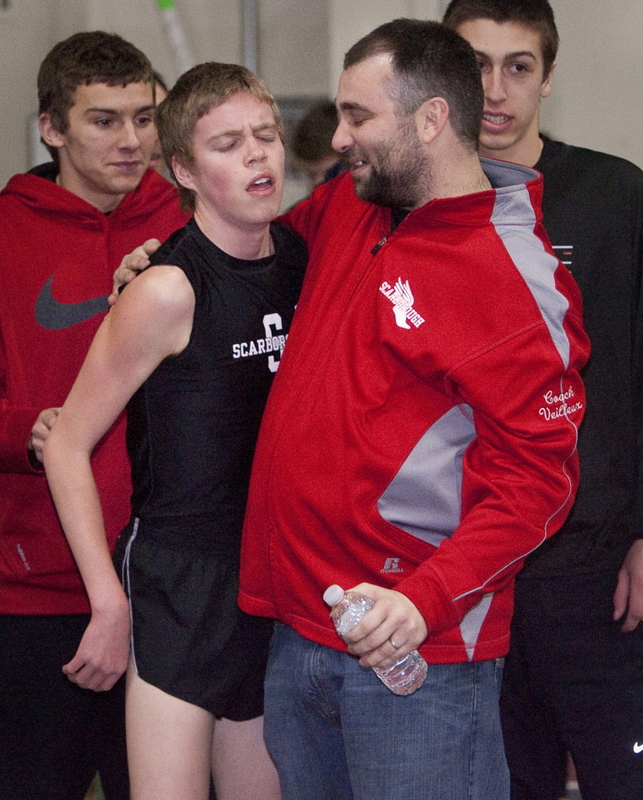 Jacob Terry of Scarborough, with Coach Derek Veilleux, captured the 2-mile as a junior last season in the Class A state championships, timed in 10 minutes, 3.72 seconds. Tucker Corbett, York senior, sprints: A top returning sprinter in Class B. Took third in the 400 (53.33) at the Class B state meet last year. Michael Cuesta, South Portland senior, jumps: Won the triple jump at last year’s Class A state meet (45-4) and was third in the long jump (20-21/2). Jake Dixon, Cheverus senior, sprints: Dominated the sprints as a junior, winning the 200 at the Class A state meet (23.08) and taking second in the 400 (50.45). Jerry Kenney, Scarborough senior, sprints: One of the top returning sprinters in Class A. Took third in the 400 (52.49) and was fifth in the 55 at the state meet (6.94). Jordan Pidgeon, York senior, jumps: Placed third in the long jump at the Class B state meet last year (19-101/4), fourth in the triple jump (40-111/2) and finished fifth in the high jump (5-10). Dylan Smith, Thornton Academy senior, jumps: One of the top two returning jumpers in Class A, Smith placed fourth at the state meet in the long jump (20-1/4). Forest Stearns, Fryeburg Academy senior, sprints: Finished second in the 400 (53.10) at the Class B state meet last year and fourth in the 200 (24.01). Jacob Terry, Scarborough senior, distance: Defending Class A champion in the 2-mile (10:03.72). Nick White, Cheverus senior, throws: Runner-up in the shot put at the Class A state meet (49-9 1/2). Alyssa Coyne, Greely junior, throws: Finished second in the shot put (35-1 3/4) at the Class B state meet as a sophomore and fourth in the pole vault (7-6). 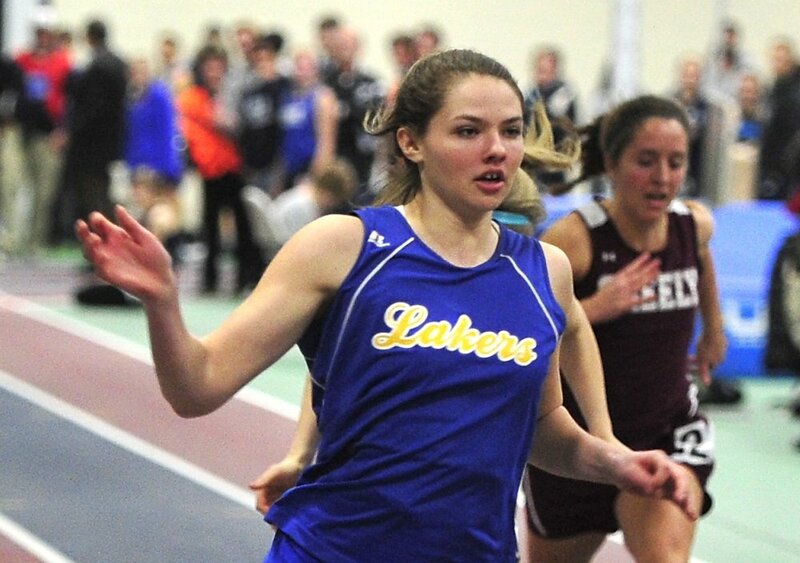 Kristin Benson, Gorham senior, sprints: Top returning 200-meter runner in Class A as last year’s runner-up (27.23). 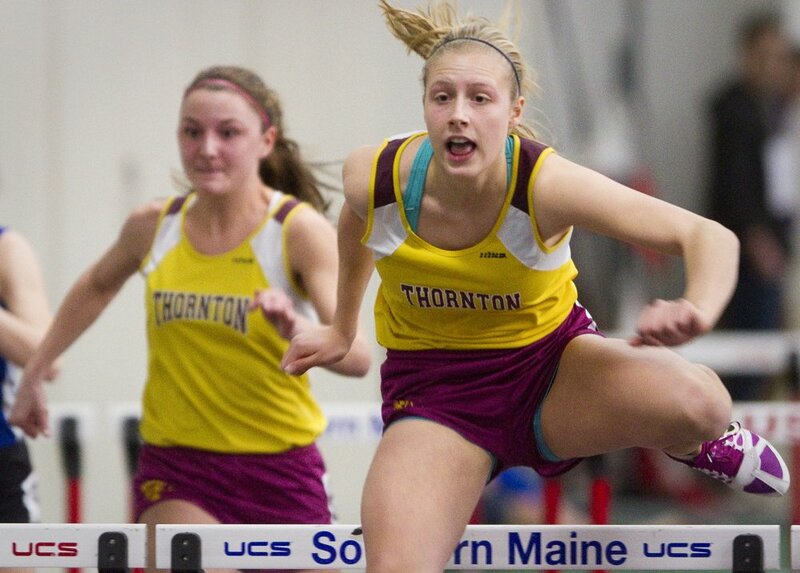 Tori Daigle, Thornton Academy senior, jumps/hurdles: Defending champion in Class A in the 55-meter hurdles (8.50) and long jump (18-1/4). Daigle broke the state record in the long jump. Emma Egan, Yarmouth junior, high jump: Runner-up in the high jump (5-2) at the Class B state meet. Also placed second in the 55 (7.59). Emma England, Falmouth junior, sprints: Finished fifth in the 200 (27.43) at the Class A state meet and was a member of the winning 800 relay team (1:50.29). Kate Hall, Lake Region senior, sprints/jumps: Has won every event she’s competed in at the Class B state meet, and holds state records in the 55 (7.05), long jump (19-33/4) and 200 (25.36). Sophia McMonagle, Greely senior, pole vault: Placed third in the pole vault (8-0) at the Class B meet last year. Emily Mason, Greely senior, distance: The top returner in the mile in Class B, she placed fifth at the state meet (5:37.45). Also was fifth in the 2-mile (12:10.22). Lauren Magnuson, South Portland senior, sprints: One of Class A’s top returning sprinters, she took third in the 55 at the Class A meet (7.55) and fourth in the 200 (27.32). Kialeigh Marston, Bonny Eagle junior, distance: Won the 800 (2:22.12) and mile (5:12.62) and was sixth in the 2-mile (11:45.46) at the Class A state meet. Alexandra Pettaway, Thornton Academy senior, jumps: Second-best returning long jumper in Class A behind teammate Tori Daigle. Fifth in both the long jump (16-11/4) and triple jump (33-10) at the state meet.